For the past four weeks, the A.C.T. M.F.A. 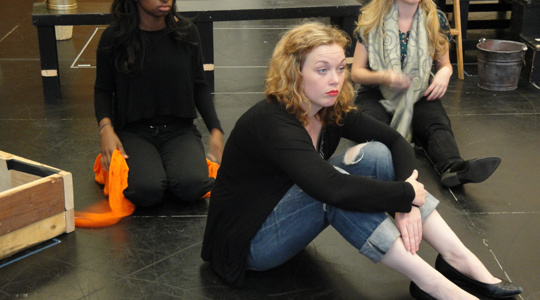 Program class of 2012 has been in rehearsals for Euripides’ Ion. The production, directed by Barbara Damashek, opens at Zeum on Thursday, April 28th for its one-weekend run. Want to know what No Exit is all about? Check out this video report by Evelyn, distinguished five-year-old theater critic and daughter of Miguel Ongpin, head carpenter at A.C.T. How do you get people to see a show? This question, like it or not, lies at the heart of the theatrical creative process. Theater can’t exist without an audience. And as much as we who make live theater like to grumble about the lengths we have to go to to attract patrons, there’s a lot to be learned from asking: What is this show about, and why would someone want to see it? In this visual post, A.C.T. 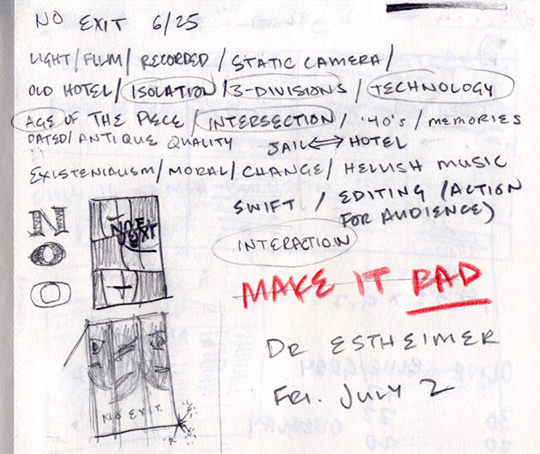 Graphic Designer Nina Fujikawa gives us a glimpse of what it’s like to distill an hour-and-a-half theatrical experience into a one-page poster that expresses the essence of The Virtual Stage and Electric Company Theatre’s live-cinema interpretation of Sartre’s existential classic No Exit. For those of you whose interest was piqued by our last post, you can now listen to the “Pursuing Pinter” panel discussion online! Just click here (and scroll down to the bottom of the screen). 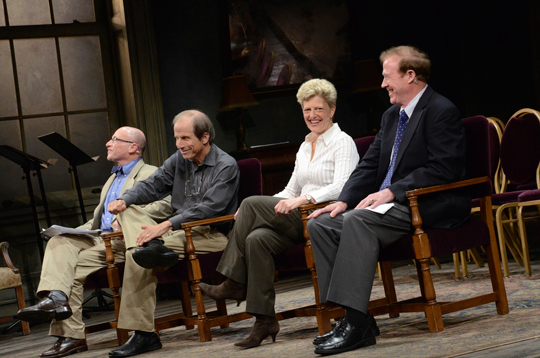 “Pursuing Pinter” panelists, March 20, 2011: (L to R) A.C.T. Resident Dramaturg Michael Paller, KQED Forum’s Michael Krasny, A.C.T. Artistic Director Carey Perloff, and Columbia University’s Austin E. Quigley. Photo by Tom Chargin.